After veteran’s home cover-up, is Rauner the state’s most secretive schmuck? 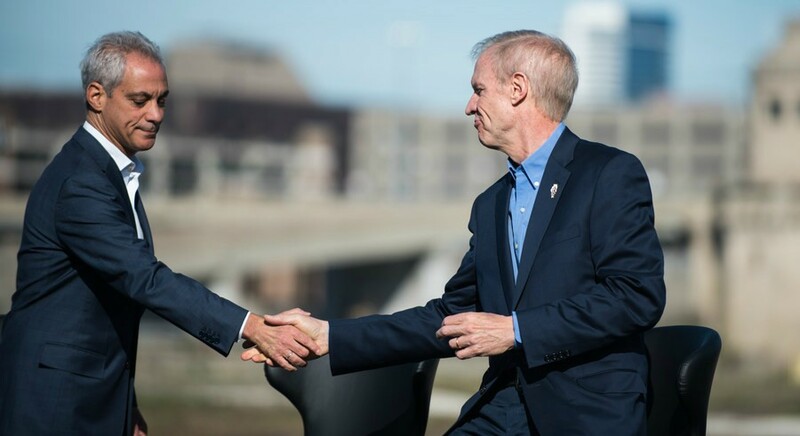 In the heated race to see who can be the state’s most secretive schmuck, Governor Rauner made moves last week to challenge his old pal, Mayor Rahm. In response to journalists who sought records via an “FOIA” request, Rauner released 450 heavily redacted pages of emails regarding the Legionnaire’s disease that killed 13 people in a state-run veteran’s home in downstate Quincy. I realize this is a contest many of you didn’t know existed, as maybe I’m the only one keeping track. So let me get right down to business with an explanation. FOIA is the acronym for a state law that supposedly obligates public figures—even mighty ones, like Rauner and Rahm—to release public documents. I’ve come to this conclusion after years of studying the legalistic dodges, employed by Rahm and Rauner, to keep you from seeing the most basic of public information. Those dodges include claiming that you’re asking for too much information, or that it will take too long to gather the information you’ve asked for, or making you wait weeks only to turn over a blank piece of paper. That’s what some of Rahm’s flunkies at the Chicago Public Schools did a few years back when Joanna Brown, a Logan Square activist, asked for public documents about a school closing. Slick move, Mr. Mayor—that’s why you’re the reigning king of FOIA schmucks. Though, as we can see, Rauner is gaining fast. Anyway, back to our explanation. Outraged over Rauner’s snail-like response to the deaths at the Illinois Veterans Home in Quincy, some state legislators filed an FOIA request to the governor’s offices to determine what he knew and when did he know it about the outbreak of Legionnaires disease there. Or more to the point—why was Rauner so slow to do anything about it? Other than, you know, the obvious answer—he apparently doesn’t give a damn about people who live in state-run veteran homes. If Mayor Rahm really wanted to stop poor people from leaving Chicago, he’d stop giving TIF handouts to corporations: Instead another TIF deal benefits a downtown building instead of neighborhoods in need. Instead another TIF deal benefits benefits a downtown building instead of neighborhoods in need. Thus, McKinney and Arnold were able to compare the un-redacted emails from Adams County with the governor’s redacted ones to determine what Rauner’s crew had blacked out in at least some of the emails. Oh, there a crafty bunch, those reporters at WBEZ. And what did they find? In short, nothing of significance to warrant the redactions. We still don’t know what was blacked out in the dozens of emails for which WBEZ has no comparisons. Keep digging, McKinney! I’m not surprised that Rauner was so contemptuously unresponsive to the legislators’ FOIA request. In 2015, he responded to a FOIA request from my old Reader colleague, Mick Dumke, for copies of his daily schedule by releasing the schedule with the names of most of the people he met with blacked out. So Mick and I knew Rauner kept a schedule. We just didn’t know the names of the people who were on it. Here’s some advice for young gun control activists: Don’t trust your parents: Boomers have messed things up pretty good. Hopefully the next generation can force our leaders to do the right thing. Boomers have messed things up pretty good. Hopefully the next generation can force our leaders to do the right thing. When we asked for an explanation, Rauner’s spokesman said state law allows governments to withhold documents protected by attorney-client privilege. I’m telling you—they just make this stuff up as they go along. There are several conclusions to reach from the WBEZ expose into Rauner’s latest FOIA scandal. One, it’s sort of reassuring to know Rauner’s as devious with lawmakers as he is with Reader and other reporters. At least, he’s not playing favorites. Two, the high-paid lawyers in Rauner’s FOIA office must not have a lot to do, if they can spend their days blacking out meaningless sentences in 450 pages of emails. And, three, as schmucky as this is—and it’s really, really schmucky—the governor’s redactions are not quite as bad as when Rahm’s flunkies sent Joanna Brown that blank piece of paper. Sorry, Bruce—but it looks like you have a ways to go before you catch up with your old pal.